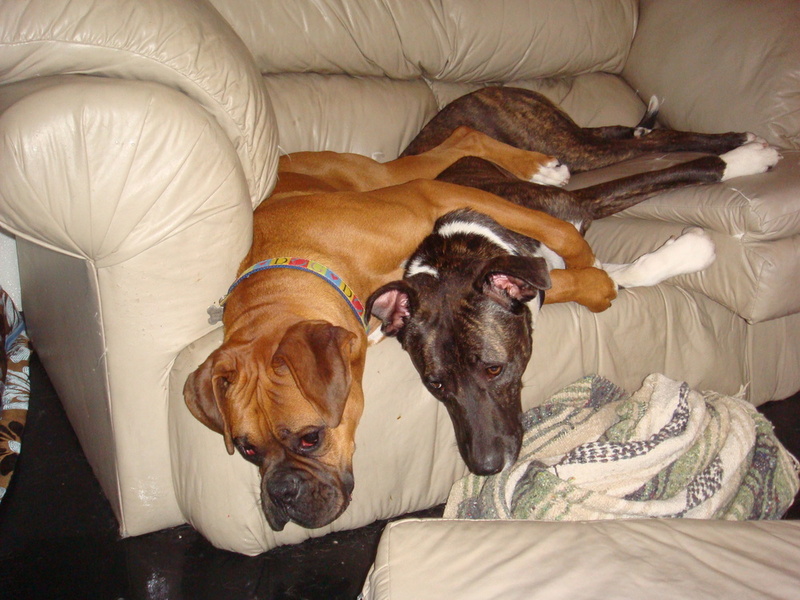 Doggie sleepovers can be arranged on a limited basis for those pet owners who must be away from home. Only daycare customers will be accommodated since we’re not a traditional boarding kennel, and only the Dog House will be used for overnight stays. Dogs are not left alone overnight. We’re with them through the night to ensure their comfort and attend to their needs. You will bring your dog’s usual meals to be served to your pet in privacy. The dogs can eat at a leisurely pace, then enjoy some additional playtime before the 10:00 p.m. potty break and bedtime. If your dog is accustomed to sleeping in a crate at night, we will provide a crate and bedding. Dogs that do not sleep in crates at home will not be crated at Dog Days either. They sleep wherever they’re most comfortable! Our facility is closed to the public from 8pm to 7am daily. On the day of departure, if you pick up your pet before 9am, there is no charge for that day's daycare services. Check-outs between 9am and 1pm will be at the half day rate of $25 plus tax. Check-outs between 1pm and 8pm will be at the full day rate of $40 plus tax. You may also use your half or full day passes. All dogs must arrive for check-in before 12pm daily and be picked up by no later than 8pm. If you are not able to pick up your dog from daycare by 8pm, we'll feed him dinner, tuck him in for the night, and we will see you the next day. It is very helpful for us to know approximately when you will be picking up your dog. Knowing that information determines the time your dog goes in for grooming or bathing, if requested, and whether we feed them dinner. We don't want your dog vomiting in your car or, even worse, getting bloat (which is life-threatening). Also, please let us know if your plans change and if you need to pick up your dog earlier or later than scheduled. Why do we insist upon check-ins between 7am to 12pm? It is our primary goal to provide a safe, positive social environment for your dog and every dog who stays with us. We do not allow check-ins after 12pm because it is our experience that when dogs arrive late it can be disruptive to the positive social environment, causing stress for and sometimes conflict among the dogs. Please arrange to have your dog arrive as early in the morning as possible (as early as 7am), giving them the opportunity to make themselves at home, enjoy a day of play, and be ready to relax with the rest of the pack at the end of the day. We want to be sure every dog has a good time! What your dog should bring for sleepovers. For your dog's own health and comfort, we want you to provide their food; the same food they usually eat. Changing a dog's diet abruptly can be very stressful on their digestive system, and especially in a new environment. This can lead to your dog feeling ill and being generally unhappy. Please bring their own food, in an airtight container, and a little more than you think they'll need for the duration of their stay. Please make sure you write your dog's name on the container along with feeding instructions and whether or not any of the food must be refrigerated or heated. We do not charge extra for special diets or feeding routines, but if feeding your dog is a complex routine, please consider how you can simplify it for us. In case we ever need to add/supplement/replace your dog's food, please be sure that we know what he's eating. If your dog has allergies please be sure that information is noted in your dog's record at our front desk. We kindly ask that your pet have a sturdy, well fitting collar that has his or her identification on it, including name and phone number. Name tags that hang off the collar sometimes may come off during play, so we recommend having a dedicated color just for daycare and sleepovers with the dog's name and your telephone number written boldly on it with permanent marker. Quick release (snap on) collars are recommended. No buckle collars, choke chains, harnesses, or prong collars will be allowed. We are happy to administer any medications your dog may need, at whatever intervals are required (generally at or around feeding times), at no additional charge. We do, however, require (as is required by law) that their pharmaceutical medications are given to us in (or with) their original containers, with accurate dosage information (as prescribed by your veterinarian) intact on the container. If your dog has a medical condition that requires medication, please be sure we are informed of and understand what the condition is. The above items are all we require for your pet's sleepovers. Unless they are special bowls required for feeding your dog such as elevated bowls for extra large breed dogs. We have plenty of bowls that are cleaned and sanitized after every use! Treats may only be given during breakfast or dinner times. Not to worry. We have plenty of beds and comfy spots for your dog to rest his weary head at night! Believe me when we I say we have toys upon toys of every shape, size, and color! Toys that bounce, toys that spin, toys that wobble, toys that squeak, toys that used to squeak. Toys are everywhere here! What to expect when your dog comes home after boarding. When you come to check-out your dog, he is going to be ecstatic to see his humans again! But rest assured, with all the excitement, activities, and new friendships with other dogs during his visit, he didn't have a whole lot of time to miss you! There may be fatigue or tiredness in the following days home. Sleeping the day away for the first 48 hours after getting home is standard. They have expended quite a bit of energy with us and their sleep cycles may be a little off since there was always so much to see and do. He may also not want to eat a regular meal as usual and may not be interested in going out for plays and walks. Diarrhea may be seen from stress that may have occurred from being away from his natural surroundings for an extended period of time. Your dog may seem sad or mopey because he misses the friends he made at Dog Days. Schedule day of play to alleviate that problem! Possible conjunctivitis from dander, fur, dry air, etc. at the daycare. Rest assured it is not like the human form of conjunctivitis and is not contagious. While all of the above may seem a bit overwhelming, think of it as a week's vacation at Disney World. While there, you may have been more active than you normally are, you take in large amounts of new information that tax your mind, your stomach may be a little off because you're not eating on your normal schedule, and you have the added stress of dealing with transportation to and from the airport and even the airport itself. When you finally return home, you're wiped out and need a vacation from your vacation! If a picture can speak a thousand words, then let these customer submitted photos tell the story of our satisfied human and canine customers! 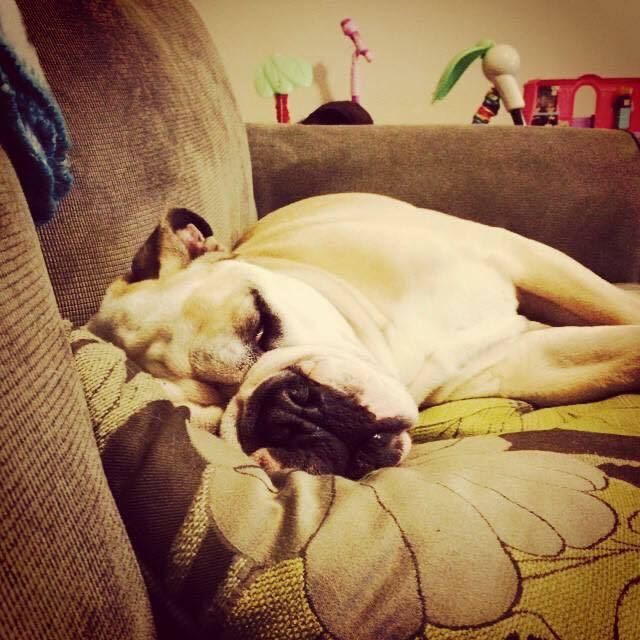 "Cheyenne crashing in her favorite spot." "Wesley asleep in the car 2 minutes after pick up!!! Didn't even make it home." "Sleepy girls after a ruff morning at Dog Days!" "I have to wake Milo up to pee after a day at Dog Days." "Georgia crashing on the bed." 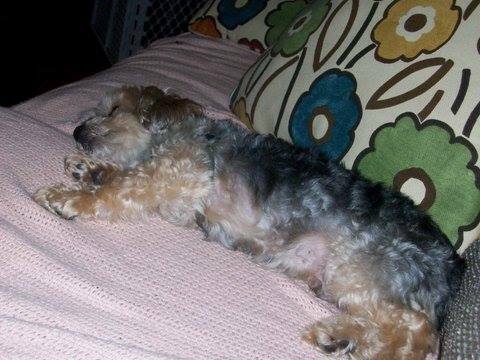 "Rocky passes out for hours after a fun day at Doggie Daycare." "Hi. I'm Bradley and after daycare I need help getting on to the couch."